True to my picture-trawling principle, I dumped it straight into a specially designated folder on my hard disc noting neither its source, nor referencing its content. In moments of inspiration-deficiency I peruse this folder, unbiased by a sense of context. But today (what luck!) I came across the author of the installation purely by chance. It’s the work of artist Pablo Valbuena. Valbuena augments architecture with light. 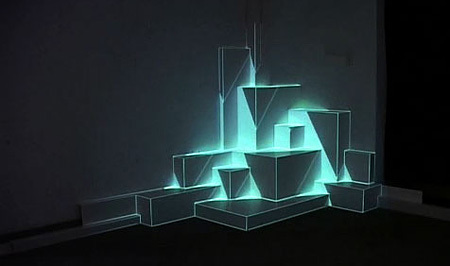 In some installations, as above, the underlying geometric form of an object is distilled through the superimposition of precise animated projections. The material itself seems to fade away. In other, grander undertakings, Valbuena punctures and extrudes whole buildings. The feasibility of these fantastic augmentations lies in the artist’s appreciation of the structural logic of the underlying architecture, and an intuition for something you could call architectural-tempo. Plaza de las Letras from tv.edgargonzalez.com on Vimeo.